Having dealt with chronic pain all my life, it sometimes feels like I’ve tried every trick in the book to find relief. When my chronic pain clients come to see me, I know that they’re often searching for the same thing I am: a break from the pain. But I also know that the search can come with lots of doubt. Is this experiment worth the money? What if trying this treatment makes it worse? Is this kind of treatment even legitimate? Today, I hope to shed some light on two different potential treatment options that I am personally experimenting with. While there are varying opinions on the efficacy of these treatments, I hope that sharing my personal experience can at least alleviate some concerns you might have. The obvious disclaimer here is that I am not a professional in these fields, and I am only speaking from my own experience. Though I’ve done some research and I am using resources given to me by other professionals, please take anything I say with a grain of salt. I don’t mean to convince you one way or the other, only share my knowledge and perhaps dispel some myths. The literal translation of Qi from Chinese is “breath,” “air,” or “gas”. The figurative translation is “material energy,” “life force,” or “energy flow”. Qi is present in many medical traditions, though it goes by different names: ki in Japanese, gi in Korean, khí in Vietnamese, prana in Hinduism, pneuma in Ancient Greece, and even ruah in Jewish culture. There are even more variations on this concept, but I don’t have time or the knowledge to list them all. But what causes a disturbance in the balance of Qi? The list is extensive. “Physical or emotional trauma, stress, lack of exercise, overexertion, seasonal changes, diet, accidents or excessive activity” are all on the list. But not to worry. Normally, your body will naturally recover from these imbalances. However, when the strain or disruption goes on for too long, or is too difficult for the body to handle, your symptoms can set in. In this kind of case, acupuncture can be an effective treatment. Acupuncture, as many know, is performed by inserting tiny – and I do mean tiny – and sterile needles at specific acupuncture points in the body, corresponding with your specific issues. 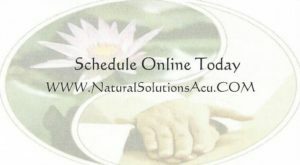 I will share more about my acupuncture experiences below. But for now, let’s move on to another treatment option: gua sha. It should be mentioned that gua sha does leave redness behind after treatment, and even some bruising. This is because the practitioner is placing repeated, pressured strokes over the skin. However, the instrument used is smooth and lubricated, so you shouldn’t experience any discomfort. I know that I didn’t. 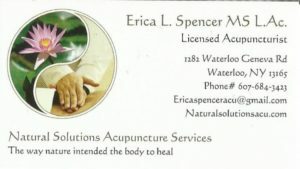 The practitioner I work with is named Erica, and I chose her because she works within my physical therapy facility, which I have been using throughout an ongoing injury. Erica is a Licensed Acupuncturist, trained through the New York Chiropractic College’s Acupuncture & Oriental Medicine program. Her extensive training and qualifications are something that I recommend you seek out in any healthcare professional. One of the best parts of working with someone as knowledgeable as Erica is that she never hesitates to explain what, why, and how she’s doing something. She is not shy about sharing the benefits and side effects that you might experience as a result of the treatment. If you have questions, just ask! Your therapist should be able to explain why they’re choosing certain meridians, and elaborate on how acupuncture can benefit you. At my most recent appointment, Erica noted that the coating on my tongue had improved in color and texture since my last session, in correspondence with the pain issues we’d been working on. After collecting this preliminary information, my session begins. You will be left alone to undress and settle onto the table, face up or down depending on your treatment or comfort level. You can discuss this with your therapist beforehand, and they will make suggestions as to your positioning. I have had sessions both face-up and face-down, and they each had different benefits. Next begins the needle insertion. This should not be painful. Here is something very important to know before you go into any therapy, especially acupuncture: If something is uncomfortable, speak up. Your acupuncturist should ask how the needle insertions feel and adjust the needle position as necessary, but even if they don’t ask – tell them how you’re feeling! This goes for any therapy, whether you’re receiving a massage, acupuncture, or something else. When done properly and on most body parts, you should barely feel the acupuncture needle being inserted. However, there are some body parts that are more sensitive than others. For example, I have had acupuncture needles inserted into the tops of my ears. I found those needles to be slightly uncomfortable, and have elected not to repeat that treatment. Erica is supportive of me making my own choices, and always asks me if I’d like to repeat a treatment or try something else. I would recommend that you take notice of what does and doesn’t work for you. Once a needle has been inserted, let the therapist know if it needs to be adjusted. The needles are so thin that sometimes one can be inserted into a hair follicle, which might sting a bit. Just let the therapist know, and he or she will adjust it. Also, if a needle doesn’t break through the lower levels of your skin – if it just punctures the top layers – it will also sting a bit. Again, just speak up. The pain is very minute but you don’t want to spend an entire session in discomfort. Erica is very open to making adjustments, and your therapist should be, too. Another thing that I appreciate about Erica is how she does her best to make the overall experience comfortable. Theoretically, the idea of having needles all over might sound like the very definition of uncomfortable. But once you’re on the table – with the nice table-warmer going and the fluffy pillows – the experience can be surprisingly relaxing. After the initial insertion, your therapist will leave you alone for a set time. Try to take that time to relax your body and mind. 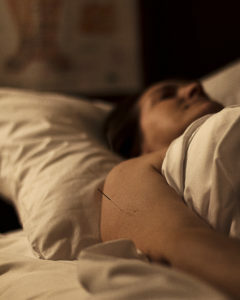 During this time, you might feel an increase in blood flow to the areas with acupuncture needles in them. This is good, and in fact, it’s kind of the point of acupuncture. Let yourself be open to your body’s signals, and let your therapist knows if anything changes or shifts during your alone time. Depending on the structure of your sessions and your specific needs, you might be done once the therapist has extracted the needles. However, when scheduling my most recent appointment with Erica, she asked if I would be interested in trying some gua sha after my acupuncture session. I was very interested to experience this treatment for the first time. First, we had our normal acupuncture session, only slightly abbreviated. But after she’d extracted the needles, Erica had me sit up and then spread a lubricant onto my shoulder, which is my problem area. After massaging that in, she began the “spooning” procedure. She scraped at my skin, which sounds unpleasant, but was more like scratching a deep itch. It did have the feeling of a massage, though I can’t quite put my finger on the exact sensation. The tool she used was white and rounded; to my eye, it looked like a soup spoon you might see at an Asian restaurant, only more curved. The treatment applies a fair amount of pressure, but should never be uncomfortable. Erica constantly checked in to see if the pressure was okay for me, and it absolutely was. But again, speak up if you are personally not comfortable with the pressure level. The scraping went on for a few minutes, touching on the same spots repeatedly. The idea is that it is drawing blood and energy to the surface to help break up any tension or blockages. As a massage therapist, I can recognize the benefits of stimulating the lymphatic system in this way, promoting detoxification and clarity throughout the body. Once she was done with the gua sha, Erica briefly massaged my upper back and shoulders to close out the session. She left me to get dressed and then returned to discuss the session, elaborate on how I might feel later on, and ask if I had any questions. Each person is different, so I can’t speak for everyone who has received these treatments. However, in my case, I have experienced side effects of both fatigue and restless sleep at night. However, I view these side effects as positive, because it tells me that things are shifting around internally, indicating that progress is being made. As far as the side effects of gua sha, I have provided an image of my treated area the following day. As you can see, there is some bruising. However, there is little to no pain, and the treated area actually feels better and more mobile than before treatment. I’ve experienced significant pain relief from my acupuncture sessions. Sometimes, it can be difficult to predict what will work for a person. For me, I know that acupuncture has been very helpful in mitigating muscle pain and detoxifying my body. So far, my gua sha pain relief experience has also been very positive, though it would take more than one treatment to see long-term benefits. For those in my area interested in an appointment, I will share Erica’s contact information at the bottom of this blog post. You can also check out her website. If you’re interested in trying out acupuncture, gua sha, or other Oriental Medicine practices, I would definitely encourage you to schedule an appointment with her. I am fortunate enough to have my sessions with her covered by my Health Savings Account, so be sure to ask about your coverage when you call. I hope that this blog post has been educational for you. I know it was a long one, but I wanted to share my unedited experience with acupuncture and gua sha. I look forward to seeing you on my table, and thank you for taking the time to learn about alternative medicine.